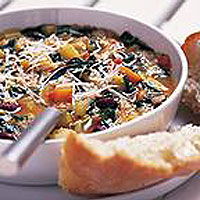 Minestrone is a traditional Italian soup. Serve with warm crusty bread. Place the oil in a large saucepan with the onion and garlic and gently fry for 8-10 minutes until the onion is soft but not brown. Add the potatoes, carrots, courgettes and celery and continue cooking gently for a further 10 minutes, stirring occasionally. Add the water (or stock) with the tomatoes, cover and simmer for 30 minutes. Stir in the pasta, kidney beans and the spinach and continue to cook for 10 minutes. Season to taste then stir in the basil. Sprinkle with the Parmesan and serve with chunks of warm crusty bread. Vegetable knife, chopping board, large saucepan, wooden spoon, grater, set of measuring spoons, measuring jug.